J&K Significance : The Second Largest Town In the State Of Jammu & Kashmir. Languages Spoken : Dogri, Hindi, English, Urdu, Kashmiri & Punjabi. It forms part of the transition between the Himalayan range in the north and the dusty plains of Punjab in the south. Between these two extremities lie a series of scrub-covered hills, forested mountain ranges and river valleys, encompassing several microclimatic regions that extend from Kishtawar in the north-east to Akhnoor in the south-west, and the historic town of Poonch in the north-west to the borders of Kangra (H P) in the south-east. The Shivalik hills cut across the area from the east to the west while the rivers Ravi, Tawi and Chenab cut their way through the region. Physically, the region of Jammu is not homogenous. It is broadly divisible into three discernible zones determined by the terrain condition and the geo-climatic environment. The southern-most of these is the 'Outer Plains' zone comprising the skirt of level lands in Jammu and Kathua districts which merge into the plains of Punjab. Toward its north and north-east rises the 'Outer Hills' zone attaining heights of 2000 to 4000 ft above mean sea level. Basohli, Reasi and better parts of Rajouri district fall in this zone. The landscape here shows open scrubs that gradually thicken from low scrub to taller trees of acacias, rhododendrons, cacti, etc. Above this zone, the terrain becomes acute in incline, the vegetal cover rich and the climatic conditions increasingly salubrious. Jammu is justly well-known for its temples. Infact, it is known as the city of temples and the every fame of its trends to overshadow its palaces, forts, forests and powerful Ziarats (shrines). If Bahu Mata is the presiding deity of Jammu, the Dargah of Peer Budhan Ali Shah is the other shrine that protects Jammuites. The other major tourist attraction is the Ragunath Temple Complex. Maharaja Gulab Singh began the construction of the Raghunath Mandir Complex in the crowded downtown Bazaar named after it, in 1851. It was left to his son, Ranbir Singh, to inaugurate it six years later perhaps the most popular temple north of Banaras, it contains representations of almost entire Hindu pantheon, though the emphasis falls on the various incarnations of Lord Vishnu. The complex houses a rich collection of ancient texts and manuscripts. For those interested in languages one can hear Hindi, Kashmiri, English, Urdu, Punjabi and Dogri spoken in Jammu. 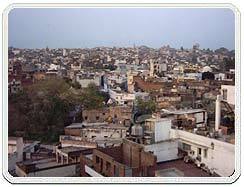 The old city of Jammu is perched on a hilltop beside the Tawi River. A new town sprawls away from the hillside and extends for some distance across the other side of the river. AkhnoorAkhnoor is located 32 kms. west of Jammu. This is a historic town and ruins of the Indus-valley civilisation is spread along the river Chenab. The town tells the tragic tale of the lovers Sohni and Mahiwal. Baba Dhansar65 kms. From Jammu, on way to Salal Dam, Baba Dhansar is a beautiful and cool picnic spot. Here, a huge spring gushes out of the mountainside in a thick grove of trees and the springs then form waterfall and flows into the holy Banganga. Next to the spring in a small grove in the rock face is a naturally formed Shivling. A mela is organised on Shivratri day every year. Bahu Fort5 kms. away from the city centre, Bahu Fort stands on a rock face on the left bank of the river Tawi. Raja Bahulochan constructed it originally over 3,000 years ago and inside there is a temple dedicated to the Hindu goddess Kali. Around the fort, is an extensive terraced garden, known as Bagh-e-Bahu. Batote125 kms from Jammu situated on the Jammu-Srinagar National Highway, is this resort, overlooking the spectacular lie of the Chenab gorge. It is a small hill resort with a small spring called Amrit Chashma. This place is very well developed with lots of commercial activity and facilities. Dera Baba BandaThis historical place is located on the bank of Mighty River Chinab (Chanderbhaga). Baba Banda Bahadur was a great soldier during Emperor Aurangjebps time, who fought in opposition to Mughals and became a great disciple of Shri. Guru Govind Singh Ji Maharaj. Visitors from various parts assemble there on the eve of Baisakhi festival. Jajjar Kotli35 kms. away from Jammu on the national highway leading towards Srinagar, is the Jajjar Kotli Tourist Complex, built on the banks of the Jajjar rivulet. The crystal clear cool water surrounded by unprecedented natural beauty makes this place an ideal picnic spot. KrimchiThe way to Shudh Mahadev Mantalai, a short detour takes one to Krimchi, site of three of the oldest temples of Jammu. The architecture of the temples shows distinct Greek influences. Further ahead in the hills is Pancheri, a beautiful hill resort. KudEnroute Srinagar from Jammu, Khud is a popular stop of the tourists. It is a hill resort in its own authority with a small but well-known mountain spring called Swami ki Bauli. Natural beauty in Kud exceeds any type of description. This place is also good for small treks and options for adventure sports are being considered in the nearby areas. Mansar Lake60 kms. from Jammu is this beautiful lake fringed by forest-covered hills deriving the name from Manasarovar, the Mansar lake is not only considered as an abbreviated form of the name of that great lake but also shares its sanctity. Mubarak Mandi PalaceThe architecture of this palace has a unique blend of Rajasthani, Mughal and Gothic styles. The Sheesh Mahal segment in the palace is most famous. The Pink Hall now houses of Dogra Art Museum which has miniature paintings of the various Hill Schools. PatnitopThis beautiful place is 112 kms. 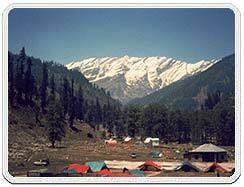 from Jammu and in recent times the place has really come up, as a tourist destination in J&K. It is located on the Jammu Srinagar highway and offers beautiful picnic spots, peaceful walks and breathtaking views of the mountainscape of the Chenab basin. Peer BabaThis is the famous dargah of the Muslim saint, Peer Budhan Ali Shah and it is believed that it is the shrine that protects the people of this city from mishaps and evil spirits. On Thursdays apart from Muslims, Hindus and Sikhs also come in large numbers to pay their respects. Peer KhohPeer Khoh is a cave shrine located on the Circular Road, dedicated to Shiva and a naturally formed Shivaling is worshipped here. The antiquity of this lingam is not known. PurnamandalProceeding towards Jammu, Pathankot is on the highway and we find few ancient temples. It's believed that these temples are built on the banks of the underground river Devak. 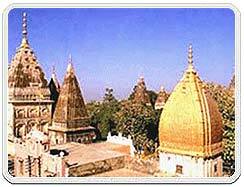 Also referred as "Chota Kashi", the main temple here is dedicated to "Umapati". The Shaivites of Kashmir Valley built these temples. This temple is dedicated to Lord Rama and is surrounded by a group of other temples, dedicated to various Hindu deities from the epic Ramayana. The inner walls of the main temple are covered with gold sheet on three sides. There are many galleries with innumerable saligrams". A small garden along the Ranbir Canal, 2 kms. from the heart of the town, provides a cool picnic spot during the summer. These gardens provide excellent walkways and viewpoints of the surrounding areas. Even in summers, water in the canal remains ice cold. Ranbireshwar Temple Located on Shalimar Road this historic temple is dedicated to Lord Shiva, which was built by Maharaja Ranbir Singh in 1883 AD. It has one central "lingam" measuring seven-and-a-half ft in height, twelve Shiva "lingams" of crystal and galleries with thousands of others carved on stone slabs. Salal Dam and Lake 95 kms. 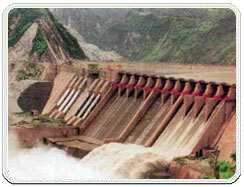 from Jammu to the west of the Holy Shrine of Vaishnodeviji is the Salal Dam and Lake. This is the largest Hydroelectric Project commissioned in the state so far. The lake behind the dam is 33 kms long and can be visited with the permission of project authorities. About 17 kms from Patnitop, is a cupshaped meadow surrounded by gigantic conifers. A place for a quite holiday, the meadow has now been developed as a golf course. It also provides opportunities for para gliding. This holy cave is 100 kms from Jammu, nearly a kilometre long with a 4-feet high naturally formed Shivling, is considered second only to the shrine of Vaishnodeviji. A festival is organized on Shivratri day. Situated about 120 kms. from Jammu, this shrine is visited by pilgrims on the full moon night of `Sawan" (July- August) to worship the "Trishul" (trident) and a mace belonging to Lord Shiva. The Devak stream originates at Sudh Mahadev and disappears among the rocks down-stream. This lake is located approximately 42 km from Jammu and is a must see for its breathtaking view. This is the ultimate refuge of the helpless; Vaishno Devi shrine is located in a cave towards the top of the Trikuta Mountains in Jammu-Kashmir. The cave shrine of Trikuta Bhagwati has been a beacon of faith and fulfillment for millions of devotees since time immemorial. Air : Jammu Airport is 6 kms. from the city centre and 48 kms. from Katra Daily Flights are accessible from Delhi and Shrinagar (i.e. Indian Airlines). Some private airlines also present air services on these routes. Rail : Jammu Tawi is a significant railhead of the Northern Railways serving the Jammu. The longest rail route that stretches from Jammu Tawi to Kanyakumari and touches almost all the major cities and towns of the country, originates from here.